Tales from a tribble: Could this be the GOP tea party candidate for 2012? Could this be the GOP tea party candidate for 2012? Death and taxes, it is said, are life's only two certainties. But in the wake of President Obama's tax compromise with congressional Republicans, only death retains the status of certainty: The future for taxes has been left up in the air. And uncertainty is not a friend of investment, growth and job creation. The deal has several key features. It reduces payroll taxes, extends unemployment benefits and keeps current tax rates intact. So far, so good. But intermixed with the benefits are considerable costs of consequence. Given the unambiguous message that the American people sent to Washington in November, it is difficult to understand how our political leaders could have reached such a disappointing agreement. The new, more conservative Congress should reach a better solution. The deal keeps current tax rates from rising to pre-Bush era levels for two years. But in 2013, unless Congress acts again, rates will increase dramatically. Of course, delay now is better than an immediate tax hike. But because the extension is only temporary, a large portion of the investment and job growth that characteristically accompanies low taxes will be lost. When entrepreneurs and employers make decisions to start or expand an enterprise, uncertainty about tax rates translates directly into a reduced propensity to invest and to hire. With only a two-year extension, investors know that before their returns are realized, tax rates may be jacked up to the levels favored by President Obama. So while the tax deal will succeed in temporarily putting more money in the hands of consumers, it will fail to deliver its full potential for creating lasting growth. It will also add to the deficit. In many cases, lowering taxes can actually increase government revenues. If new businesses, new investments and new hiring are spurred by the prospects of better after-tax returns, the taxes paid by these new or growing businesses and employees can more than make up for the lower rates of taxation. But once again, because the tax deal is temporary, a large portion of this beneficent effect is missing. What some are calling a grand compromise is not grand at all, except in its price tag. The total package will cost nearly $1 trillion, resulting in substantial new borrowing at a time when we are already drowning in red ink. Part of the tax deal is a temporary reduction in payroll taxes. The president was insistent, however, that only the employee's payroll taxes be reduced — the portion paid by the employer is to remain the same. Again, the president is looking to get more money into the hands of the consumer to boost near-term spending. But by refusing to lower the cost of hiring a new employee, he fails to encourage what the American people want even more than lower taxes — more good jobs. Like the income tax deal, the payroll tax deal will add to the deficit. For those without jobs, the tax compromise extends unemployment benefits for 13 months. A decent and humane society must have a strong safety net for the unemployed. I served for 15 years as a lay pastor in my church and saw the heartbreak of joblessness up close; a shattering loss of faith in oneself is but only one of many forms the suffering can take. Nonetheless, the vital necessity of providing for those without work should not be used as an excuse to ignore the very real problems of our unemployment system. In this, as in so many other arenas of government policy, unemployment insurance has many unintended effects. The indisputable fact is that unemployment benefits, despite a web of regulations, actually serve to discourage some individuals from taking jobs, especially when the benefits extend across years. The system is also not designed for a flexible economy like ours in which some employees move from job to job for short periods, and are therefore ineligible for unemployment compensation when they are faced with a protracted spell without work. To remedy such problems we need a very different model, perhaps establishing individual unemployment savings accounts over which employees would exercise direct control when they lose their jobs, or putting in place financial incentives for employers to hire and train the long-term unemployed. One thing is certain: While we cannot rebuild our flawed system overnight, we are surely not required to borrow the funds to pay for it. In spending $56.5 billion to extend benefits, the deal is sacrificing the bedrock Republican principle that new expenditures be paid for with offsetting budget cuts. President Obama has reason to celebrate. The deal delivers short-term economic stimulus, and it does so at the very time he wants it most, before the 2012 elections. But the long term health of our great engine of prosperity will remain very much in doubt. To the twin inevitabilities of death and taxes, we may now have to add persistent high unemployment. 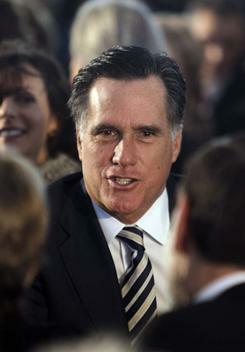 Mitt Romney, the former governor of Massachusetts, sought the Republican presidential nomination in 2008. I have been undecided...going back and forth about the tax deal between Obama and senate GOP leaders, but when you have brilliant conservatives like Krauthammer, Hugh Hewitt and Romney against the deal...that's where I must be.